This is a translation of Niklas Wiklund’s (Lieutenant-Commander in the Swedish Armed Forces, aka @Twitt_Skipper) Swedish blogpost on 12 October 2014 Ny normalbild eller ett nytt kallt krig? James Mashiri‘s Finnish translation was very helpful considering my poor Swedish: Uusi normaalitila vai uusi kylmä sota? The purpose of this text is to be an eye-opener to those who have not yet understood the serious and broad shifts in the security landscape whose main author is Russia. There are many who continue to live in ignorance and look for everlasting peace, even though we are hearing daily reports on events that are connected – directly or in a roundabout way – to the our safety in the northern Europe. The situation in our neighborhood and the relations between Russia and the West have so fundamentally changed that we must describe this new situation properly and factually in order to get the full gravity of it across. This post is lengthy but I hope that you will stick with it, because in all likelihood this is my most important blog post thus far. 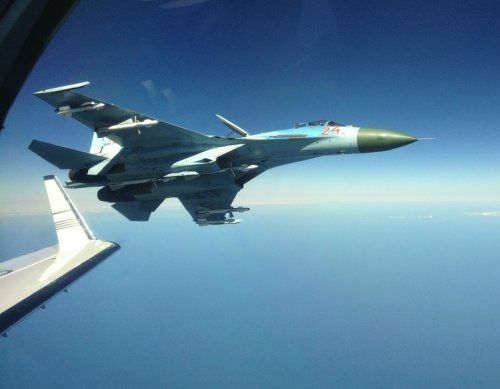 A Russian fighter plane flying close to a Swedish reconnaissance aircraft. The Swedish national authority for signals intelligence FRA published this picture on their website on 3 October 2014 stating that the behavior Russian planes has changed recently. They fly much closer to other plane and the airspace violations against Sweden and Finland have been numerous in 2014. Cold War – how to define it? This post is about the question whether we are heading towards a Cold War – or are we there already? Or are we facing nothing but a new ‘normal’ in international relations. To tackle these questions we need to find a definition for the concept ‘Cold War’ and what it contains and then connect several indicators to actual events. The label ‘Cold War’ has been used in various ways. It has described both a time period and a state of affairs. Here we are interested in the Cold War as a definition for a state of affairs. Are the relations between the states generally poor or frozen? All means except direct force are applied against the opposing faction? No compromises are reached, instead one-sided sanctions are in place? Is psychological warfare taking place? Are the means of economic warfare used (sanctions)? Does the rhetoric employ aggressive slogans? Are there threats of violence or territorial demands? Are there coups or other similar operations underway? Are military buildups taking place? Are military allies being sought and are alliances strengthened? Are there limited or local ‘hot’ wars? Keep these indicators in mind and think about them as you view events from last three years and especially those of 2014! Before that we should take a look further back and at the developments in Russia over the last decade. 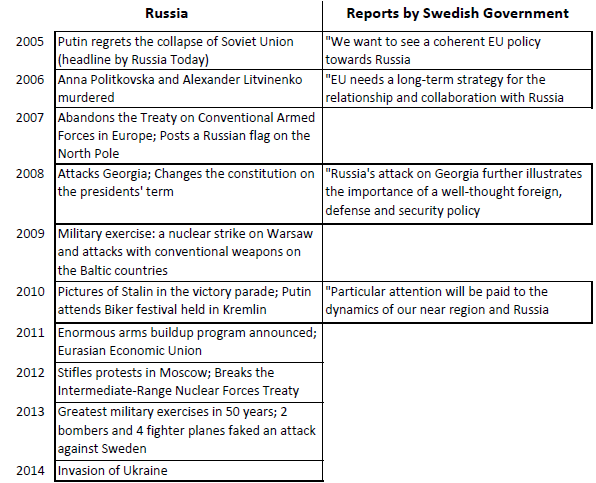 Johan Wiktorin @forsvarsakerhet has presented the original Swedish table in his blog post titled “It’s Russia, stupid”. It shows several events and markers of Russian/Putin’s activities that one would have expected to affect the world’s and Sweden’s view of Russia – and collectively they should have caused strong reactions in our security policy and defense. But this hasn’t taken place! Below we list events from last three years in more detail. It is evident that the frequency of important events and actions has greatly increased during this period. Russia had a major military exercise Zapad in the Baltic Sea that caused significant alarm. The exercise was an eye-opener. Russia brought landing craft to the Baltic Sea without a prior notice and assembled a large number of aircraft for airborne invasion. During the Zapad exercise Sweden’s defense forces rallied their few troops and run their own preparedness exercise in and around Gotland. This probably lit up a few lights showing the real level of Sweden’s effectiveness, plans and preparedness. The chief of Sweden’s military intelligence service MUST said in a newspaper interview in Svenska Dagbladet (SvD) that there is increased signals intelligence (SIGINT) against Sweden. A New Year’s interview with the Supreme Commander of the Swedish Armed Forces General Sverker Göranson in SvD got a lot of attention. He indicated that Sweden could defend only one location, for one week only and only against an attack of a limited scale. The term ‘one-week defense’ was created. NATO states that it cannot help Sweden in the event of war. “You cannot be outside NATO but want everything that Nato can give,” NATO Secretary-General Fogh Rasmussen said. Russian television channel RT1 makes fun of the Swedish ‘one-week defense’ on a YouTube music video (no longer available) – the tune was Swedish music group Abba’s ‘Mamma Mia’. Russia practiced nuclear strikes against Swedish targets with Tu-22M3 bombers. This event becomes known as the ‘Russian Easter’ and it has an impact on the Swedish scrambling readiness. It was revealed that the Russian military buildup with a budget of inconceivable 540 billion euros would be accelerated. The rapid-deployment troops were to be a priority. There was talk about Putin’s new capability for lightning strikes. Russia began, without any prior notice, the largest preparedness exercise since the Cold War. 160,000 soldiers participated in this enormous event and it included huge troop concentrations all over Russia. Russian signals intelligence vessel Fjodor Golovin passed through the narrow passage of international waters between Öland and Gotland for the first time in 20 years. It was observing the Northern Coasts exercise run by Sweden and several NATO countries. “We have not seen this kind of Russian activity by SIGINT ships on the westside of Gotland since the Cold War”, said Rear Admiral Jan Thörnqvist. Russia’s activity with extensive military exercises was a cause for worry in the Baltic states. “We don’t live in world of ‘eternal peace’. Russia is beginning Zapad 2013 exercise (trans. West 2013), where the target is the occupation of the Baltics”, Estonia’s President Toomas Hendrik Ilves said. Crimean crisis began and later Russia annexed the peninsula from Ukraine. Also the war between Ukraine and Russia became later a fact. The world stood helpless and responseless in the face of this unforeseen turn of events (see Russia taking over Crimea predicted in 2008). The relations between Russia and the West deteriorated to the worst level in years. This was the start of a series of further events. Anders Lindberg in Aftonbladet writes “Don’t start a new Cold War”. “It is now most important to lower the tensions in the area. Parallels are now drawn with the Russian actions in the war with Georgia in 2008, where Russia in practical terms conquered South Ossetia and Abkhazia. Should something like that happen with Crimea we would be facing a new form of the Cold War.“ This is exactly what took place, even perhaps worse: Russia conquered Crimea, annexed it, and the war in Ukraine is still going on. Scandinavian’s airplane that took off from the Copenhagen airport nearly collided with a Russian SIGINT aircraft southwest of Skåne. The Russian plane flew without a transponder. Dagens Nyherter reports on the concern and alarm of the Estonians despite their membership in NATO and in EU. “All European countries should be worried when Russia tells us that it will protect Russians abroad and that it will use its military to obtain its goals”, said Estonia’s Foreign Minister Urmas Paet. The Swedish Security Police Säpo tells that Russia had stepped up espionage against Sweden. Russia had among other things bought a massive amount of maps of Sweden, which is hard to see as anything else than as a preparation for war. The Swedish government announced that for the time being Sweden cancels all bilateral collaborations with Russia. Joint military activities that had been planned were called off. NATO put its Standing NATO Mine Countermeasures Group 1 in action in the Baltic region. The group had previously been unused. This was a part of the NATO actions in response to the Russian aggressive acts in Ukraine and also a show of support to the Baltic member states where the concern on the development in Russia has been growing. USA announced that it will send troops to Poland in response to Russian actions in Ukraine. There is a military buildup in the Baltic Sea – but no new Cold War, said specialists from the Swedish National Defence College and the Stockholm International Peace Research Institute. They think that the right description of the situation is not a Cold War. The difference is that now there are no two blocks – the former allies of the Soviet Union are now NATO members. NATO announced that it will triple the number of aircraft participating in the Baltic Air Policing operation in the Baltics and in Poland. The Swedish government makes a unique decision to allow NATO AWACS flights through Swedish airspace. (AWACS stands for Airborne Warning and Control System) This will shorten the flight time from Norway’s NATO air force base to Poland. This is another response to the Russian attack against Ukraine and the increased military activity in the region around Sweden. “We are not back to the Cold War”, said lieutenant colonel Jörgen Forsberg in a newspaper interview. On the same day the Estonia’s President Toomas Hendrik Ilves called Sweden a security hole of the Baltic Sea. Estonia and other EU countries had told the National Defense Council that they would like to see Sweden becoming a NATO member. One of several incidents in 2014 when Russian planes violate the Finnish airspace. USA made plans to send strategic B-52 bombers to the Baltic Sea for mine dropping exercise. The plan is unique that must be viewed as a message for Russia. Russia began a large exercise that is a response to NATO’s Baltic Sea exercises BALTOPS and Sabre Strike. Russian planes and vessels act threateningly making close passes. The Russian exercise lasts two weeks and it includes landing training. Swedish newspapers noted the events and wrote about the power games and military showdowns. Russian attack plane Su-24 violates the Swedish airspace. Another close call between a passenger plane and a Russian military plane near borders of Denmark and Sweden. The Russian plane had no transponder also in this case. The situation was possible avoided because a Danish F-16 fighter plane that was following the Russian plane used flares to warn the passenger plane. Polish MiG-29 fighter planes violated (unintentionally) the Swedish airspace over Gotland. It was later revealed that the planes were a part of NATO’s standby forces that had scrambled to intercept Russian military planes near the Swedish airspace. Russian air defense shot down the Malaysian Airlines flight MH17 while passing through Ukraine airspace. All 298 personnel and passengers were killed. Everything points towards that the plane was downed with a BUK system of air defense missiles operated by Russian officers. An American SIGINT aircraft violated the Swedish airspace after Russian air defense started tracking it and established a lock on it and after Russian fighters had scrambled to intercept. This plane of Boeing RC-135 Rivet Joint type took the fastest route out of the area and flew over Gotland. This was during the day following the downing of MH17. The Swedish government informs that sanctions against Russia being increased. Russian planes violate Finnish airspace for the third time within six days. Finland views the incidents as intentional. Finnish research vessel Aranda operated by the Finnish Environment Institute SYKE was harrassed by Russian military vessels and helicopters in the vicinity of the Gotland Deep. Numerous media outlets reported on this on 11 October 2014. Expressen published pictures of the Russian warships taken onboard Aranda. On another earlier incident Russian warship had ordered Aranda to change its course near the same location on 2 August 2014, Aranda had not complied. The incidents may have occurred on Sweden’s exclusive economic zone. The Gotland deep is located near the border of the economic zones of Sweden and Lithuania. A Russian strike team kidnapped Estonian security policeman Eston Kohver near the Russian border and takes him to the Russian side. “The timing points that the kidnapping of Eston Kohver, 43, was authorized by the highest ranks in Russia. It took place right after Barack Obama had visited Estonia in connection to a NATO summit. Russia is giving Estonia a warning: ‘You are as safe as Obama made you think,” said Johan Eellend, researcher from the Swedish Defence Research Agency FOI. Kohver’s imprisonment in Russia continues. EU sets new sanctions against Russia. Russian trucks with TIR signs haven’t had any company decals or, in other instance, a truck was seen driving to the center of the city of Luleå – on a Sunday. President Obama announces that USA will modernize its entire nuclear arsenal. It will cost $350 billion. The nuclear warheads, missiles, submarines and bomber planes will be modernized or replaced with new systems. The upgrade is the largest ever and it is told to be a direct consequence of the invasion of Ukraine by Russia. Two Russian Su-24 attack planes violate purposefully the Swedish airspace near Öland. Russia begins the large Vostok 2014 exercise that is participated by 100,000 men and strategic bomber planes. Iskander M artillery missiles are included in the exercises. On the same day Russia detained a Lithuanian fishing vessel from the international waters in the Barents Sea and forced it to the port in Murmansk. Russia uses Tu-22M3 planes again over the Baltic Sea, it’s probably training for long-range missile strikes. Nearly all stanby fighters belonging to the coastal countries of the Baltic Sea scramble. The Swedish Armed Forces increases their presence at sea with corvettes. The government grants 100 million kroner for the purpose due to the decreased stability in the region. Denmark deploys F-16 fighters in Greenland in a response to Russia’s increased activity in the polar region. The Swedish national authority for signals intelligence FRA and the Swedish Armed Forces confirmed that Russian fighter jets have disturbed Swedish SIGINT planes. “They are acting in a way that we haven’t seen before; the flights are more demanding now. As our government has stated, the situation is disturbed and Russia is much more aggressive than before,” Deputy Chief of Operations Anders Grenstad said. USA agrees to sell AUM-158 JASSM missiles to Poland to be used in F-16 fighters. The missiles can be used to destroy important immobile targets protected by air defense systems. The whole Russian air force had a five-day civilian defense exercise, excluding some troops in Kaliningrad. “The air forces from Sakhalin to Kaliningrad are practicing emergency response,” Emergencies Ministry spokesman Alexander Drobyshevsky said, specifying that the drill includes aerial engineer, nuclear, chemical and biological reconnaissance. Two JAS 39 Gripen fighters broke the sound barrier over Gotland, which is highly untypical. “It was a so-called ‘hard’ task, and as a matter of fact I can’t say anymore than that,” the air force’s spokesperson said to Sveriges Radio. American tanks and other combat vehicles arrived in Estonia. This was a direct result of NATO’s decision to keep its troops continually in the Baltics as long as Russia forms a threat for the area. “American troops are here as a deterrent showing that NATO is able to react quickly to a foreign threat,” said Estonia’s Minister of Defense Sven Mikser. USA announces that a missile defense system will be setup in Poland in response to Russia’s development of the R-500 missile. If this will happen soon it will cause increased tensions in the region. USA will sell FGM-148 anti-tank missiles to Estonia. Russia’s Minister of Defense Sergei Shoigu announced that Russia will develop a spaceborne warning system against nuclear strikes. There were reports of Russia’s strategic missile forces having preparedness drills in concert with Russia’s Northern Navy. There were news about some disturbances on road 77 at the Estonia-Russia border. The time line presented above with event connected to Russia is only a set based on what I have seen in media. There are surely more examples of the current situation and how it has progressed; I may have missed some of the more important events. Johan Wiktorin wrote on 6 June 2014 an inspiring post on the paradigm: “Attack against Sweden is unlikely”. Wiktorin thinks that a single, unprovoked attack exercise against Sweden (the ‘Russian Easter’ was directed only against Sweden) along with Säpo data show that a separate attack against Sweden is no longer unlikely. The probability, however, remains very small, but it has been there since last year’s Good Friday. This blogpost begins with a quote from Supreme Commander Göranson. It was given in the Supreme Commander’s meeting with chiefs a few weeks ago. Thus it is an official message to all leaders in the Swedish Armed Forces. My own analysis of that is that the Armed Forces should not be an alarmist nor be an official who uses the label ‘Cold War’ to further the discussion about the new situation. The question, whether we are moving towards a new Cold War or are we in it already, should be answered by political entities – not from the military, even if they do have the best and the most current facts. Regardless: Is this really only a new state of normalcy that we are seeing when we put the events on a timeline like I have done? That in the end you must answer by yourself. Who in the end has it right, it’s for the historians to settle when the books about this era will be written sometime in the future. Personally, I don’t think it unlikely that the Black Swan theory would be fitting for this situation. The most important thing is that our politicians and our government set their minds to this and realize the seriousness of the matter. It remains so whether you define the events and the development as a new normal state of affairs or a new Cold War. Sweden must re-evaluate the safety assurances and the defense it has. The conclusions that have been made by the National Defense Council are not relevant in the current situation. We have been left with a military organization that was created primarily for international assignments and to deal with an enemy that is weakly organized and technologically backward. The security environment has changed drastically and it is impossible to neglect it any longer. It must be dealt with!